[03-22-2012] The show is currently in previews on Broadway. Check out Shelley Ross’ review. 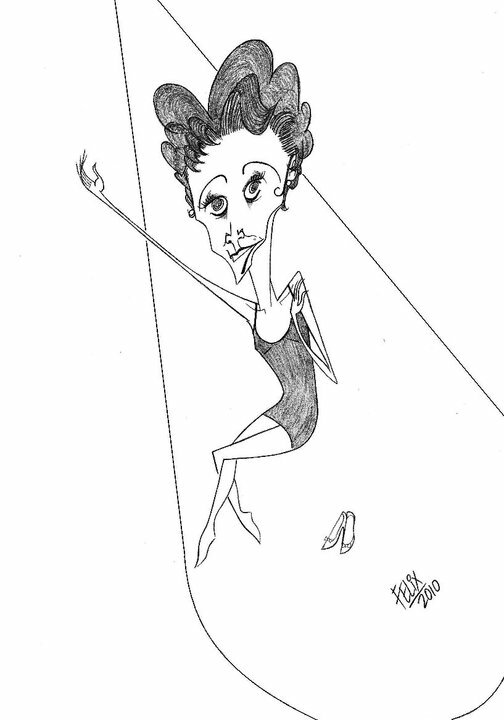 Charicature of Tracie Bennett as Judy Garland by "Felix"
As with any high profile Garland project, the show has the online Garland fan “community” abuzz. The most vocal seem to be those who haven’t even seen the show. I have not seen the show either, so I obviously can’t give my own review or comments about it. But judging from the current reviews about Ms. Bennett’s performance and the show itself (from the real critics out there), I know that if I were in London I would definitely make the time to see it. The show’s playwright, Peter Quilter, has agreed to answer some questions. His answers give us all some insight into the show and the motivations behind it. Thank you Peter! I appreciate you taking time out of your schedule to answer these questions, and I wish you continued success. Finally, I hope the show makes it over to this “side of the pond” sometime in the future. Maybe even way out west here to San Francisco! Note: The Judy Room questions are in bold, with Mr. Quilter’s answers immediately following. How did you become interested in Judy Garland? And why write a show about her? I’ve always been a fan, of course, but what most fascinated me was the very end of her career. I always found that very compelling and tragic plus, most importantly, dramatic. I thought it would make for a wonderful stage play. Tell us about the casting process. Tracie Bennett is getting rave reviews for her portrayal of Garland. Did you always have her in mind? I never write with anyone in mind, but Tracie was the first actress ever suggested for it. She is obsessed by Garland and grabbed the part immediately and with both fists. Garland’s 1969 voice was no longer at its peak. Should the actress/singer of your play use Judy’s more worn-out 1969 voice, or the Garland voice of more resplendent times? The play offers both – sometimes we see her at her peak, in full voice, and at other times we see her struggling. I think you have to show Garland singing well in order for the audience to see how much she has lost when she sings at her worst. So the play gives you both, the shining star and the broken star. How do you reconcile the robust Judy Garland of Girl Crazy or Carnegie Hall with the wilted Judy Garland of her Talk of the Town run, as depicted in End of the Rainbow? Are they the same person? She was a fascinating, charming, compelling and incredibly funny woman – always. Life, love and fame just got the better of her. Garland has been depicted in song, fiction, film, poetry, classical music, and the theater. How do you account for the fact that her life and career have been such a rich source of inspiration to so many creative people? She’s an icon, unique. The world loves incredibly talented people – we’re fascinated by them. Once your brilliance reaches the heights that Garland reached, you have immortality in your grasp. She’ll be written about forever. Your snapshot of Judy at the Talk of the Town is rather disturbing. Do you think she was mad? No. Damaged, lost, distraught, frightened. But still with hope, still trying. Garland fans may be upset that Judy is portrayed with her human frailties on display, and not on the pedestal most like to keep her. Did, or does, that make a difference in how you approached her life? It should always be remembered that this is a snapshot – one moment in her life. All the other material out there, the magical movies, the concert recordings, the biographies. I make no attempt to show her whole life, just these few weeks. But there’s nothing here to upset the fans. It’s tragic at times, of course, but we are full of Judy fans in the theatre and they adore the show because we bring Garland back to life – at her best, at her worst, but always true. Technically, how did you prepare to write End of the Rainbow? Did you do a lot of research? No, I didn’t research hugely because I wanted to keep the play focused on the characters and emotions. Bio plays so often get bogged down in facts and figures and a desperate need to be precise. I was more interested in a dramatic play that is inspired by these events rather than being a factual documentary of them. The play employs some of Judy’s own words from her movies and real life, many of which are zingers. Her sense of humor is also often devastatingly black. Do you have a favorite quote that best captures her state of mind? I actually think the play uses very few things she actually said – only a very small handful. But I couldn’t resist using “Well if they wheeled them in, they can wheel them back out again”. That just floors me. It’s so wicked, so funny. In earlier years, Garland was joyful. Is there any joy at all left in her at this point in her life? Yes, at the start of the play she’s in love and full of hope. She is hoping for a great success in London and she has her new fiancé Mickey Deans on her arm. I think she always looked for the joy in life, but it sometimes was beyond her grasp. Billy Van Zandt’s 2006 play The Property Known as Garland takes place in Judy’s dressing room during her final concert in Copenhagen in March 1969. She ruminates about many of the same issues as in End of the Rainbow, except that Zandt’s play does not use music as extensively as yours. How does hearing Judy sing enhance your play? I don’t know this play so it would be unfair for me to make comparisons. But I do think if you present a play about one of the great singing stars of all time, then the audience should rightfully expect to hear the actress sing. You use many of Judy’s songs very often in discomforting ways. When she sings “You Made Me Love You” to a pill, should one laugh or cry, or both? Well, that’s up to you! I often mix things up, put a joke line next to a serious line, or use a romantic song in a cold tragic situation. It creates mood and drama and keeps the audience close. In the play, Mickey Deans, Judy’s last husband, and Anthony, her pianist, think they can save her. Could Judy Garland have been saved? I don’t have the answer for that. But it seems to me that she just kept making terrible mistakes with the men in her life. Not all of them – but many of them. If she’d found the right man, someone who offered unconditional love and could provide security for her, then maybe… But her demons were so strong – the pills, the pills. It was an almost impossible situation. Was Judy’s short life a long suicide? It’s a good question, but I’m not the right person to answer that. Ask a psychiatrist! Are you kidding!? I think she’s miraculous. If Judy Garland were sitting in the room with you right now, what would you say to her? Put a kettle on, we’ve got a lot to talk about. Has the experience of writing and putting together a show about this part of Judy’s life changed your view of her as a performer and person? If so, how? It’s made me feel closer to her and terribly grateful. I feel privileged to have had this chance to create a part of her life on stage. It’s such a gift. You know, we had six of the London critics giving us the maximum 5 star rating – and those critics also gave us a standing ovation on opening night. Some of that was for the actors, some for me – but I genuinely believe that most of the applause that night was for Judy Garland. Fascinating interview! I, for one, hope the production gets to Broadway, and would look forward to seeing it there. I think that even the darkest moments of Judy’s life deserve attention, and through great writing and great acting one can come away with a better understanding and appreciation of her. Judy was a human being with the frailties of human beings, and denying that she was a human being is perceiving her as someone she was not. Exploiting this late period in her life is not tabloid sensationalism, but rather a portal to getting a grip on a story that is complex.